Pregnancy care isn’t just for the mother-to-be, but for her baby too. Proper nerve and spinal function is crucial for a baby’s development and essential for the well-being and comfort of the mother. 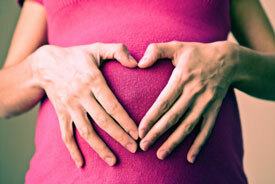 Like always, the effects of chiropractic care during pregnancy extend well beyond only symptom relief. Aside from the obvious need for a baby to develop in an environment controlled by a fully engaged nervous system, another practical benefit to chiropractic care throughout pregnancy is space and mobility. By optimizing the alignment and motion of the mother’s pelvis and spine, we can help a developing baby have the best space to thrive, and improve the chances for the mother to have a safer more natural birth experience. If you are looking to optimize your well-being and that of your developing baby, safe and natural chiropractic care makes sense! Call us to book an assessment today.